Let's talk FALL!!! I just looked at some of the comments from my Facebook friends and Cheri said it was 35 degrees this morning! Wah.... I wish it would cool off here... I'm in the mood for FALL and it's really hard to feel the love of the fall leaves, brisk air, pumpkins, and scare crows when you're sweating! I hate hot weather... why am I here in Florida? hhhhmmmmm I ask that question! Well, for one reason, it's beautiful here and that's where all the family is! 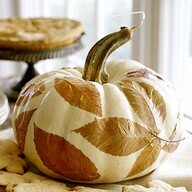 So... with that cool weather in mind... it's going to be all about fall and pumpkins today! I may have shown this before...but it needs to be seen again. So clever.... insert your punch bowl and some ice... you have an awesome cooler for beer or soda. It can also be used as the actual punch bowl with real punch in it!!! I love fancy pumpkins... we couldn't wait each year to go into the Salem Collection showroom in Atlanta to see the new designs they have for their awesome pumpkins! That reminds me... my daughter asked to borrow mine for Alexis birthday part this Saturday. Today is her birthday... she's a big 6 years old!!! These have been decorated with stencils! 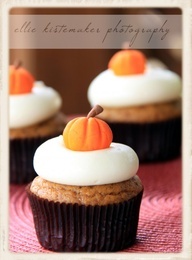 Isn't this an adorable cupcake....so simple and so sweet. If you can't make these fancy pumpkins (from icing) you can buy the sweet little pumpkin candies...they work just as well! 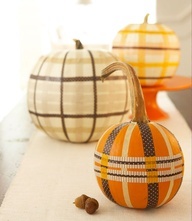 Here's another simple and sweet way to dress up your table when entertaining. 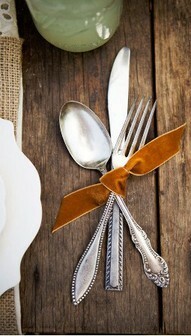 A simple velour ribbon in fall colors tied around your silverware. Many times...less is better - don't you think? 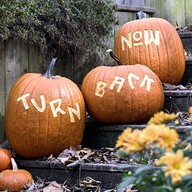 I know this has nothing to do with pumpkins... but I just want to tell you... I love weddings where they have picked their color palette and they let the bridesmaids wear dresses in those colors - but each one is different...to compliment their body style. How smart is that? Me... I can't wear strapless dresses...so if my bride wanted me to wear one of these I would have to not be in the wedding. However, I could pick another style and fit right in with these gals. So pretty!! 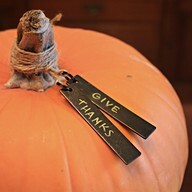 How wonderful is this simple tag? Give Thanks! Those are two pretty powerful words.... aren't they? 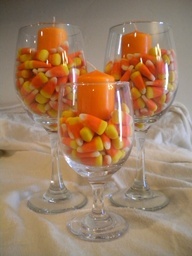 This is yummy looking.... simple pedestal glasses filled with candy corn and inexpensive votive candles. Now...when I saw this I was staring at it in wonder. 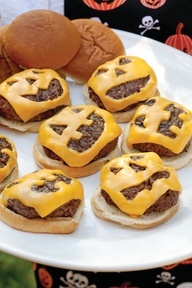 Do you know how much time it would take to carve out these little pieces of cheese for the burgers! NOT! I'm going for a smiley face from ketchup and mustard! That's about all you would get at the Parsons home! TURN BACK NOW!!! So great to put on your steps for Halloween!!! It would be even cooler if they were lite up so you could see them in the dark!!! hhhmmm.... how about a little spotlight in the yard?!!!! 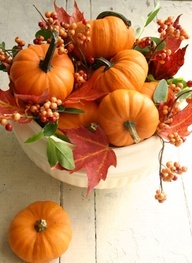 How sweet and classy.... a simple sweet bowl of baby pumpkins, leaves, and berries! This does not take a rocket scientist to put together! We can all do this? 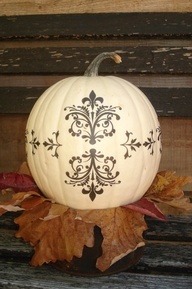 This pumpkin is so different...they have taken Fall leaves and decoupaged them to the outside of this beautiful white pumpkin... (my favorite) ! How pretty... I also love it when they leave the stems on the pumpkins. The more weird the shape...the better I like them! 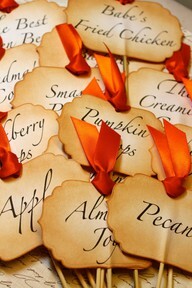 Cute, cute, cute tags for your Fall Buffet when you all get together to "pig out". A simple pumpkin shape on a stick (you can use dowels or sucker sticks) and a bright orange ribbon for the top! 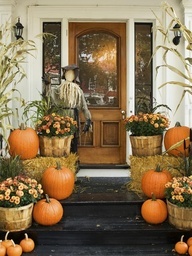 And...here we have the most "Welcoming" fall door.... full of pumpkins, straw, corn stalks, mums and a friendly scarecrow!!! How delicious is this? I wish we could get corn stalks here...you know... out in a field! I always wanted them for the store but they are no where to be found...unless you order them through a florist and they want your first born child to pay for them! And...here is your sweet "aaahhhhh" picture. Nothing cuter than a kitten playing in a pile of crispy leaves!!! 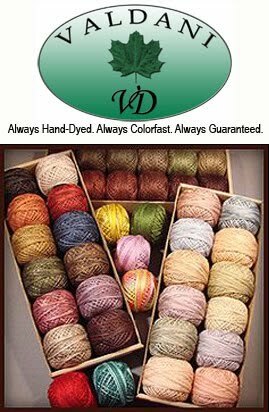 Have a blessed day.... sew a bunch.... and if you live in Florida with me.... think COOL WEATHER!